Would President Romney Be Good For Tech, Science, And Space Innovation In The U.S.? What would President Mitt do for science, technology, and startups in America? And would he use his missionary zeal to drive policy in these directions? Willard Mitt Romney is 64, an age when many of us start thinking about retiring, picking up golf, spending time with the grandkids, and reminiscing about the past. But not Romney. This is a guy after all who has earned a BA in English, then a JD and MBA from Harvard. He’s spent a long time as a missionary in France–a place he loves–and speaks French. He was a successful CEO and cofounded a private equity firm that became one of the largest in the U.S. All of this suggests that Mitt is not a big one for chilling out. So assuming that Romney would stay as active should he be elected President, what would that mean for science, technology, and innovation in this country? Would President Mitt use his missionary zeal to drive policy in these directions? In the same year that Apple’s Macintosh first hit, with images of government-smashing radicalism in its advertising, Mitt Romney was a cofounder of Bain Capital–a spin-off of consulting firm Bain & Co. that Romney had successfully managed before. BC is a private equity firm that’s invested in some huge American brands, with names like Burger King, Dunkin Donuts, Staples, Toys “R” Us, and the Warner Music Group on its client lists. This fuels Romney’s thinking on startups, and he recently gave us a hint of this with what the Washington Post calls a “robust defense of his work” at BC. There he said that while BC’s investments weren’t always successful, it had a good record, and that venture capital helps “grow companies and create jobs,” is a “major part of the economy” and “he’s proud to be a part of it.” MittRomney.com goes into more detail, noting that four of the startups BC funded (including Staples) created up to 120,000 jobs. It’s all good for Mitt’s job too, as BC earned him much of the hard cash he’s used to fund his political ambitions since then. In terms of controversies about startup employment, Romney’s separately noted he’s in favor of H1B visas, because he “likes the idea of the best and brightest in the world coming here,” adding “I’d rather have them come here permanently than come and go, but I believe our visa program is designed to help us solve gaps in our employment pool.” It’s all a “competitive battle with the rest of the world; a battle where we need to stay the most powerful nation”…which is a stance the people of France, say, would probably poo poo. But broadly speaking, Romney’s right behind Silicon Valley and the venture capital investment structure, and its role is so important he’s even said he wouldn’t boost capital gains tax. Outside of the Valley, Romney’s even floated the idea of government-owned technology centers–using advanced research into alternative designs for nuclear reactors as an example. It’s a conflicted position, as Mitt’s not one for big government involvement in these markets, but it’s a start. So President Mitt would seem keen to preserve much of the status quo of the startup system in the U.S., because he believes it contributes directly to America’s superpower position. 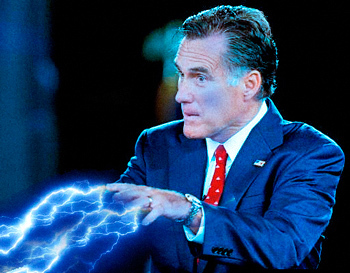 Mitt’s Mormonism isn’t an irrelevant part of his character, it’s something that really drives the man. Interestingly, it’s been noted that Romney actually does support both the theory of evolution and human-induced climate change (despite a slightly flip-flopping denialist stance)–something that marks him as relatively unusual in the current Republican Presidential race. And one theory is that the pragmatic stance of his church may be behind this attitude. Of course in many ways new science drives new innovations and that drives startups and the greater U.S. economy in our technical age, so Romney’s support for H1B visas also influences the future of scientific research under a potential President Mitt. His description of the “pebble” reactor design in the government-owned tech centers ideas was a little, shall we say, sketchy…and he courted much controversy with statements last year on the climate, saying “I don’t speak for the scientific community, of course, but I believe the world is getting warmer, and I believe that humans have contributed to that.” He added: “I can’t prove that, but I believe based on what I read that the world is getting warmer.” Hmm. How about getting some high-quality, smart, socially-savvy science advisors on board, then? They’d give some solid scientific facts and some names to quote, so then we’d actually start to believe you know what you’re talking about? But oddly, searching for Romney’s deeper insight into scientific matters like nanotech, neuroscience, or any more of the exciting advances of our time (things Potential President Newt has expressed a stance on) doesn’t yield much. Even his own website doesn’t spin up much info–merely noting in a letter that for over 200 years the U.S. has “excelled in science”…and presumably Mitt would like that to carry on. That’s not a scientifically sound conclusion, though.